The word is alive and has the ability to change and transform our life! Jesus was with God even before the world was created (John 17:5-10), and He is known as the word and is the light of men which shines in the darkness (John 1:1-13). 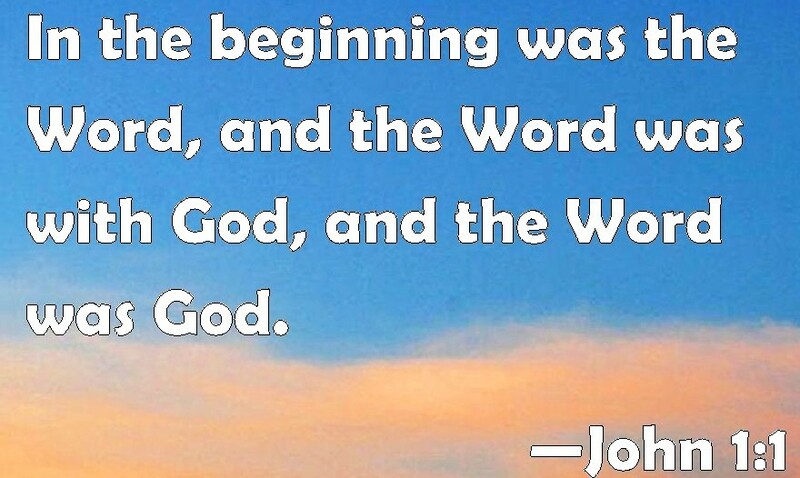 In the beginning was the Word, and the Word was with God, and the Word was God.2 The same was in the beginning with God.3 All things were made by him; and without him was not any thing made that was made.4 In him was life; and the life was the light of men.5 And the light shineth in darkness; and the darkness comprehended it not.6 There was a man sent from God, whose name was John.7 The same came for a witness, to bear witness of the Light, that all men through him might believe.8 He was not that Light, but was sent to bear witness of that Light.9 That was the true Light, which lighteth every man that cometh into the world.10 He was in the world, and the world was made by him, and the world knew him not.11 He came unto his own, and his own received him not.12 But as many as received him, to them gave he power to become the sons of God, even to them that believe on his name:13 Which were born, not of blood, nor of the will of the flesh, nor of the will of man, but of God. Any and all power is of God and He is the one who has fearfully and wonderfully made us. In the song of Moses we learn it is He alone who can wound and heal (Deuteronomy 32:39-43).It is by the stripes our Lord and Saviour endured that allows us to be healed! (1 Peter 2:20-25). 20 For what glory is it, if, when ye be buffeted for your faults, ye shall take it patiently? but if, when ye do well, and suffer for it, ye take it patiently, this is acceptable with God.21 For even hereunto were ye called: because Christ also suffered for us, leaving us an example, that ye should follow his steps:22 Who did no sin, neither was guile found in his mouth:23 Who, when he was reviled, reviled not again; when he suffered, he threatened not; but committed himself to him that judgeth righteously:24 Who his own self bare our sins in his own body on the tree, that we, being dead to sins, should live unto righteousness: by whose stripes ye were healed.25 For ye were as sheep going astray; but are now returned unto the Shepherd and Bishop of your souls. The centurion knew how powerful the word of God was, for when he sought Jesus on behalf of his servant who was suffering from the palsy he knew just by Jesus speaking the word his servant would be healed(Matthew 8:5-13). 5 And when Jesus was entered into Capernaum, there came unto him a centurion, beseeching him,6 And saying, Lord, my servant lieth at home sick of the palsy, grievously tormented.7 And Jesus saith unto him, I will come and heal him.8 The centurion answered and said, Lord, I am not worthy that thou shouldest come under my roof: but speak the word only, and my servant shall be healed.9 For I am a man under authority, having soldiers under me: and I say to this man, Go, and he goeth; and to another, Come, and he cometh; and to my servant, Do this, and he doeth it.10 When Jesus heard it, he marvelled, and said to them that followed, Verily I say unto you, I have not found so great faith, no, not in Israel.11 And I say unto you, That many shall come from the east and west, and shall sit down with Abraham, and Isaac, and Jacob, in the kingdom of heaven.12 But the children of the kingdom shall be cast out into outer darkness: there shall be weeping and gnashing of teeth.13 And Jesus said unto the centurion, Go thy way; and as thou hast believed, so be it done unto thee. And his servant was healed in the selfsame hour. May we search the scriptures and find what the word of God can do to transform us in serving Him (Romans 12:1-2). I beseech you therefore, brethren, by the mercies of God, that ye present your bodies a living sacrifice, holy, acceptable unto God, which is your reasonable service.2 And be not conformed to this world: but be ye transformed by the renewing of your mind, that ye may prove what is that good, and acceptable, and perfect, will of God. ← Why December 25? Saturnalia, Fallen Angels, Giants, Demons: Is This What Jesus Was Trying To Tell Us?